Turkey has plenty more to offer its visitors than beautiful beaches and blue seas. Of course, the majority of people who go on holiday to Turkey are looking for those things, but the country has many other sights and attractions to draw tourists from around the world, including the following three natural wonders. In the Denizli province you’ll find the world heritage Pammukale site, also known as Cotton Castle. It’s an amazing landscape that has been created by calcicum bicarbonate rich thermal water flowing through the area. As the water cooled, it left the calcium bicarbonate deposits behind, and the ridges and steps we see there today gradually appeared. The area still attracts people who come to bathe in the hot springs for health benefits. 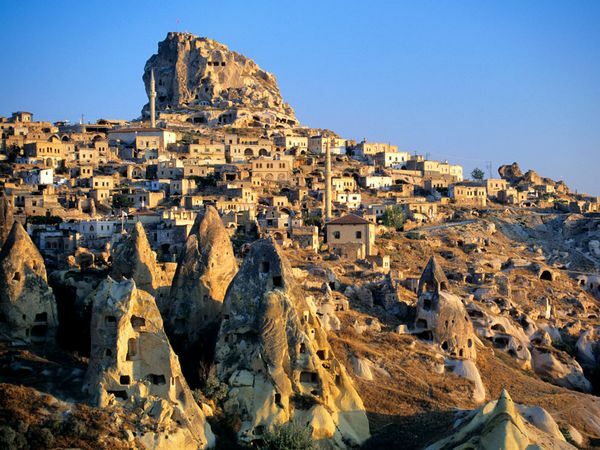 Another unusual landscape that you’ll find in Turkey is Cappadocia in Central Anatolia. The whole area is covered with toadstool shaped chimneys. This lunar-esque landscape was caused by volcanic activity millions of years ago. At some point in the past, people used to live inside the chimneys and in the same area, you can visit underground churches and villages that have been carved into the rocks. One of the best ways to appreciate this strange landscape is by hot air balloon. A third fascinating natural site in Turkey is Saklikent Gorge in the Mugla province. This is Turkey’s deepest and longest gorge. It’s so deep that the water at the bottom remains icy cold year round as the sun never reaches it. It’s a great place to go hiking and there are plenty of different accommodation choices in the area near the gorge, including treehouses if you want to sleep under the starlit sky. Flights to Turkey are easy to find and often cheap as many budget airlines fly there. If you’re planning to visit some of these amazing sights, it’s probably a good idea to hire a car so you have your own transport for getting from place to place. However, if you’re going on a package holiday, you’ll also be able to book excursions to all of these fascinating places.